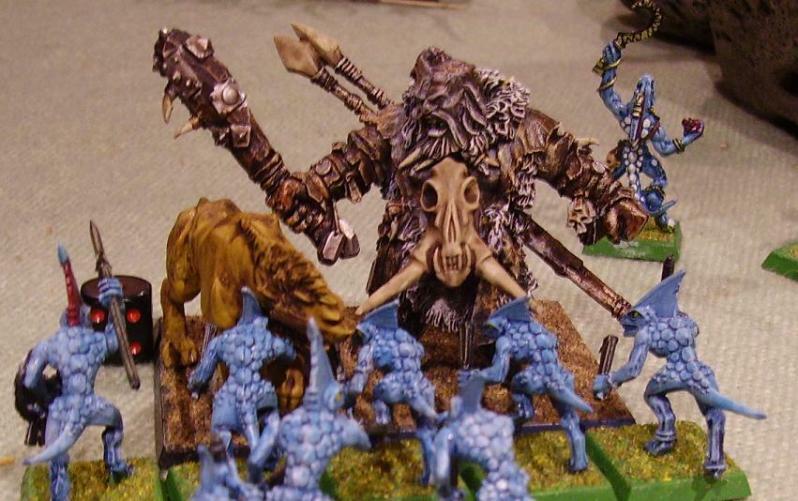 This Warhammer blog is completely unofficial and in no way endorsed by Games Workshop Limited. "...the Scraplauncher hurled its first load into the air killing six skink skirmishers in total. The Gnoblar crew giggled manically at the sight of what they had done, then busied themselves re-loading." The tyrant Agrobog and his brother Bufbar had been marching for months now. Their armies had been much reduced by the hardships and fights they had encountered on the way south, so that they were both convinced of the cleverness of their decision to ally their forces to undertake the quest. It was a long way to the jungles of the Southlands, and as they approached their goal they still reckoned they had (together) forces enough to get what they wanted. They had heard that these very jungles contained the riches of a dying race. That the once mighty Slann who dwelt here, lived in golden temples and commanded dwindling armies of bejewelled warriors. And once they heard it, both could not wait to get here and take it for themselves. Some Ogres amongst their forces had not died due to pestilence or battle, but had instead been slain by one or other of their brothers. They were the ones who spoke aloud their opinion that the journey was taking too long, or that it was a fool’s errand, or that there was no such thing as a golden city in the jungles. One died simply for saying he did not believe in jungles! None of the surviving Ogres were arguing now, however, for the enemies scouts had been encountered, and the jungle could be seen ahead of them. Most convincing of all was the glimpse of something bright, like the tip of a pyramid, piercing up through the distant green canopy. Something that shined bright whenever the sun shined upon it. In fact, their worries had transformed into a very different set of concerns – would there be enough Ogres to carry all the gold, or should they leave some behind? And would the army be strong enough to make it all the way back with the gold? But now they had more immediate concerns. It seemed the enemy was not willing to allow them to enter the jungle. An army was approaching across the barren land at the southern edge of the desert, where only a scattering of copses and giant rocks broke up the flat terrain. Agrobog and his brother grinned. At last this would be a battle worth fighting, one in which victory would bring riches and not just a meagre feast on scrawny, stinking, goblin flesh, or the strangely spicy meat got from nomadic desert riders. Their commands were shouted, each trying to outdo his brother in loudness, and their two armies arrayed themselves for the fight. 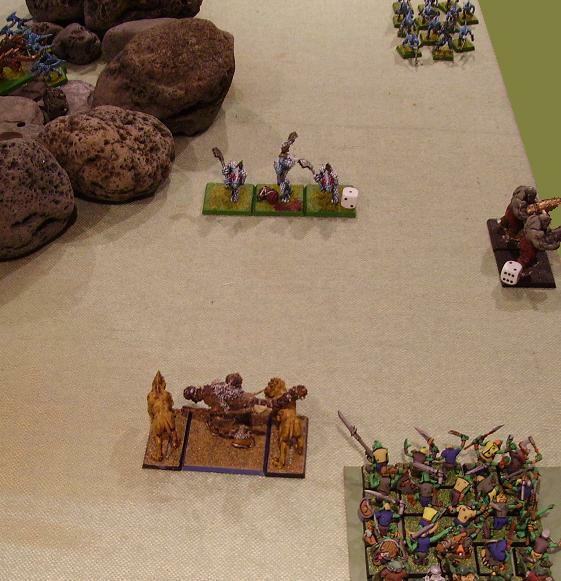 Two bodies of gnoblars, both belonging to Agrobog’s ogres, were sent to the very right of the line, with orders to lead astray any enemies that tried to outflank the army. Agrobog knew full well that they were good at running away, and so was pleased to give them orders that would have them do what they do best. Several little companies of Leadbelchers were also sent to the same flank. Both brothers recognised that no plan should rely on gnoblars, and so agreed that a bunch of cannon wielding lads could deal excellent well with anything that did get through. Bufbar’s Hunter and his brace of Sabretooths chose also to join that flank, though they had in mind not to slow the enemy down but to get around the flank themselves. The final touch was Agrobog’s order to his two Maneaters to follow up behind the right flank. A last precaution against slippery enemies, as well as ‘encouragement’ for his own troops to behave as expected. Agrobog’s Slave Giant followed his master obediently, and the last remaining Scrap Launcher came up next to him too. The others, all three of them, had been lost in a variety of (amusing) ways during the long voyage. This one, however, had been constructed upon the back of a giant Southland’s creature that the ogres had captured from an Arabyan caravan. It’s appearance made the Gnoblars wonder if it was perhaps a cousin to the Rhinox, but the Ogres had failed to notice. 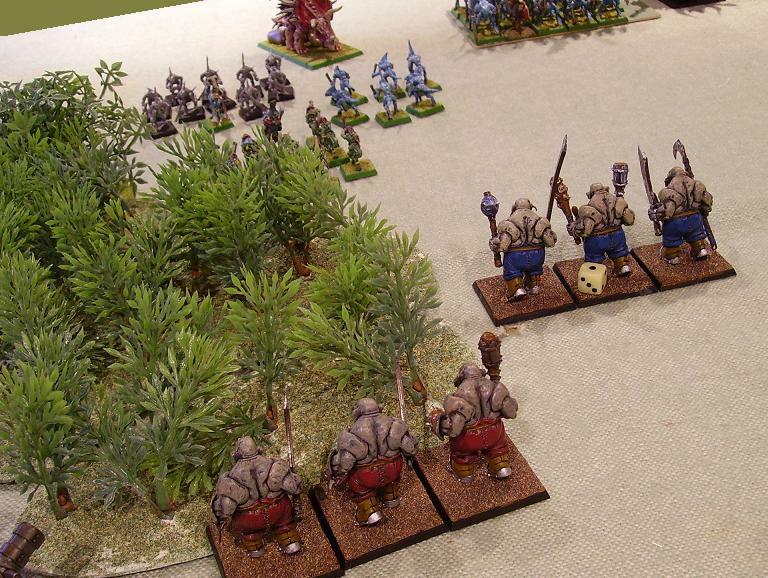 Between the right flank and the centre, more Gnoblars and a handful of Bulls marched up. Out on the left flank came several of Bufbar’s lads: Maneaters and Leadbelchers. 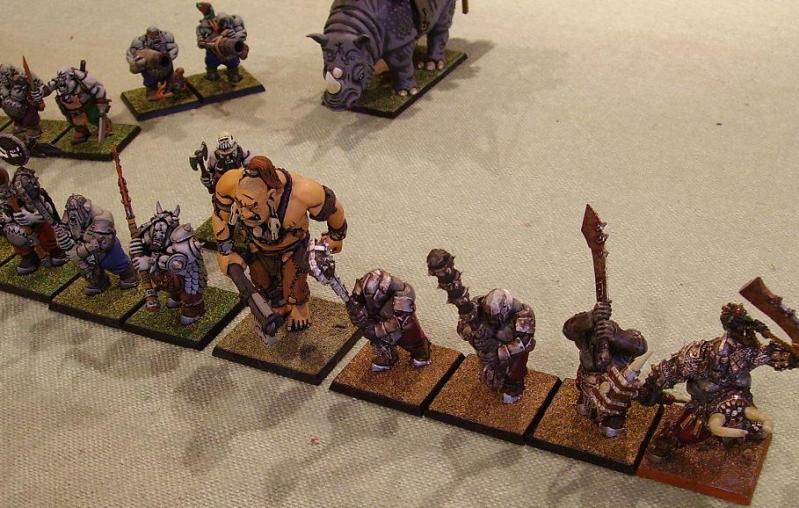 And farthest to the left one last Ogre unit, the second of Agrabog’s Bulls. 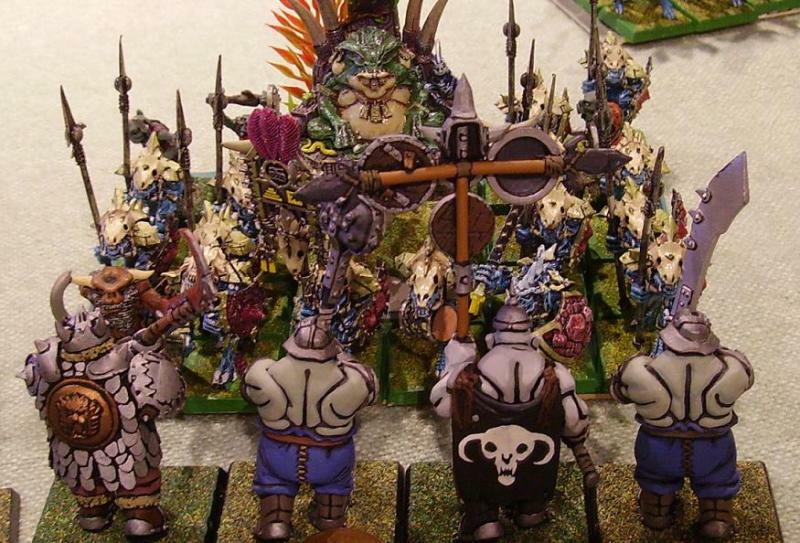 The Ogres’ enemy was an army of Lizardmen, led by the ancient Slann Lord Actyrix. He had absolutely no idea where the brutish Ogres had come from, but he knew they meant no good, for he knew of their greed for gold. Deciding that he could not stand the thought of them putting even a foot into his jungle, he marched all the forces he could muster (4000 point) out to the desert edge. He commanded his Saurus Oldblood to lead the Cold One riders on the left flank, backed by the Kroxigors and some skink skirmishers. His orders were clear – get around the foe and strike them from the flank, or even better, from the rear. With such a strike force as this, the Oldblood was confident he could do what his wise master commanded. 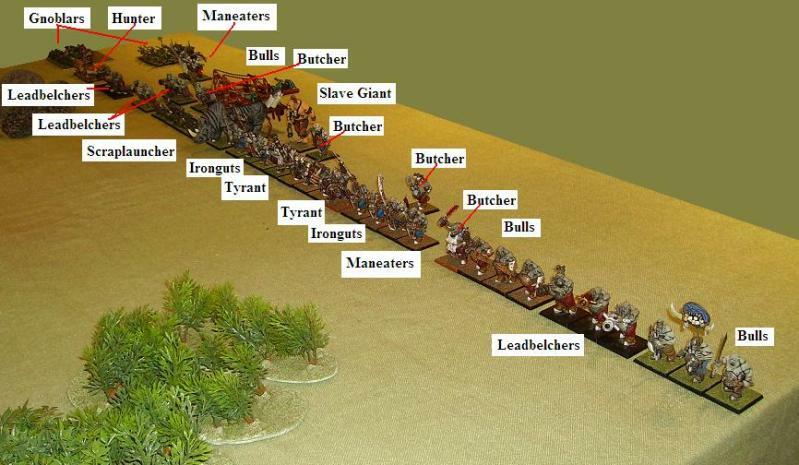 The centre of the Lizardmen force consisted of three large regiments of Saurus Warriors, the central one being Templeguard and thus having the honour of escorting Lord Actyrix. Two Stegadons and a body of Razordons supported the centre, whilst on the far right two companies of Skink Skirmishers sneaked their way forwards, ready to spit poisoned darts by the dozen at the foe. Unseen by friend of foe alike, and thus unknown to all but Lord Actyrix, a further little company of Skinks were present – chameleon skinks. 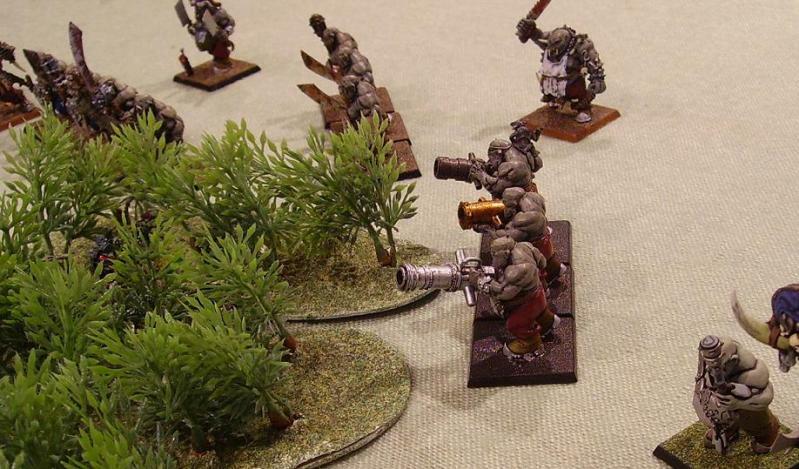 These were hidden in the copse of trees right in front of the Ogres’ left flank. For the briefest of moments both armies halted, as if both were assessing their strange foe, the likes of which neither had ever faced in battle before. 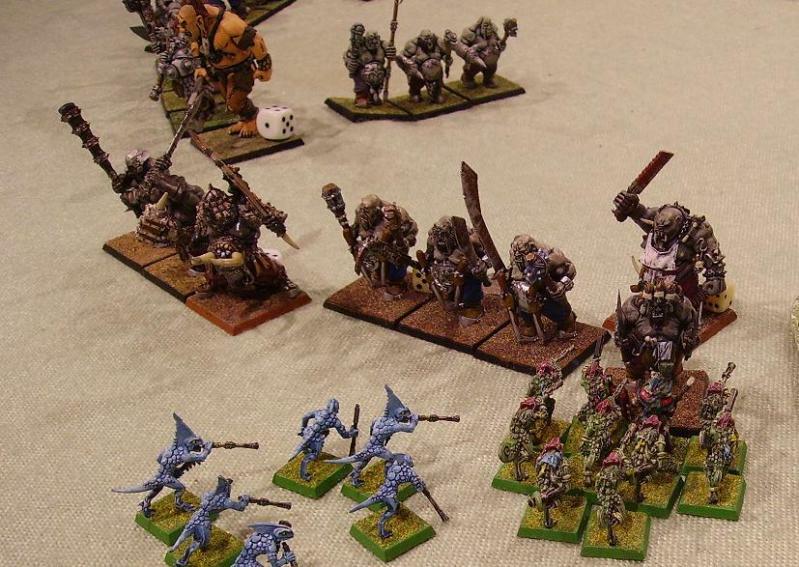 The Ogres, ravenously hungry for flesh and gold, made the first move. Clutching his Weirdstone necklace for good luck, one butcher suddenly felt pain wrack through his body. Not that this perturbed him, as he was used to such pain, but he did wonder if it boded well! 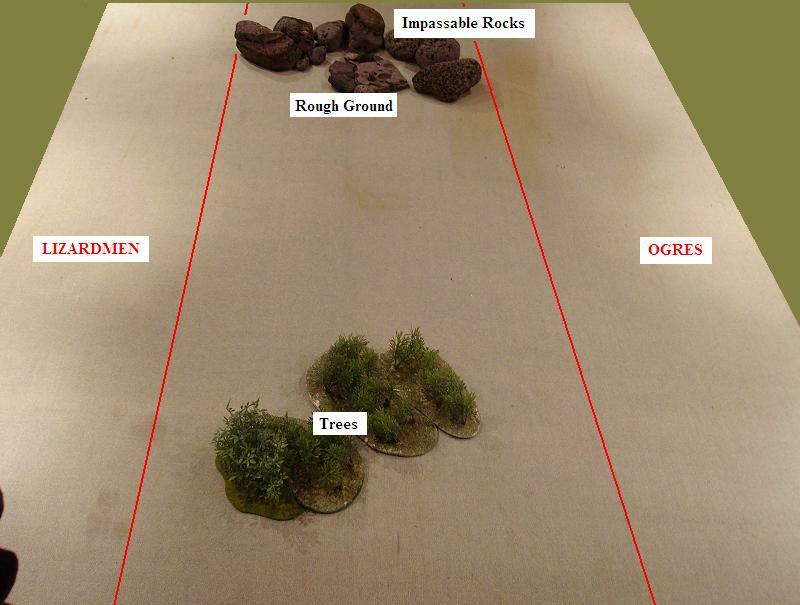 On the far right flank the Ogres prepared a trap for whatever enemies might try to come that way around the towering rocks. The Gnoblars shuffled forwards nervously, knowing that their only role was to draw the enemy on (but in a direction which suited the Ogres). Meanwhile, the Hunter and the Leadbelchers hefted themselves and their mighty weapons into place ready to hurl their deadly missiles at the foe. In the centre of the Ogre line the real advance began, though both Tyrants bawled at their warriors to keep the line. They had agreed before the battle to meet the foe as one, delivering a hammer blow from the Ironguts, Tyrants, Slavegiant and Maneaters all at the same time, and directed at whatever formed the centre of the enemy lines. Of course, much depended on the rest of their forces managing to fend off any tricky flank attacks. Both Tyrants knew the dangers of a foe more nimble than their brutish warriors. They had already encountered the little lizard scouts and discovered the delights of poison tipped darts. A handful of such darts merely pricking the skin could fell the mightiest of Ogres, thus the need for good defences on the army’s flanks. 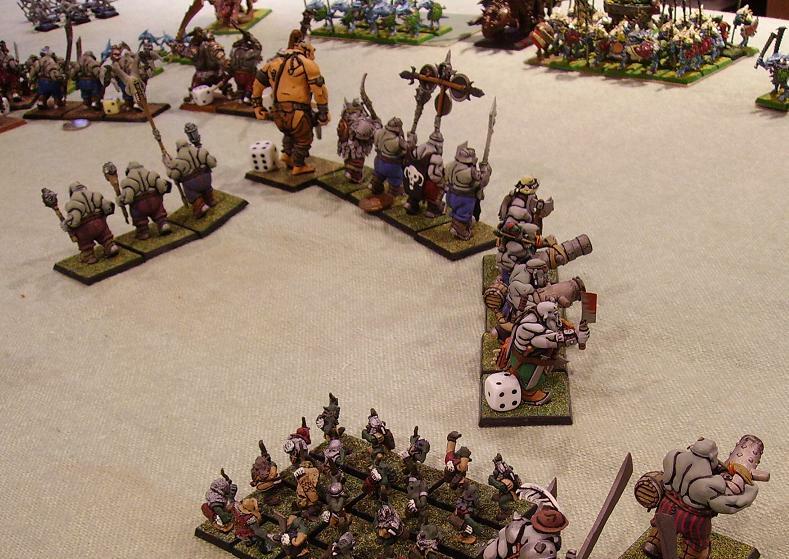 On the left, therefore, the Ogre line advanced cautiously, trying to prepare itself for enemy trickery. They might not be able to see any enemies in the trees, but all where in agreement that they would be there – even Ogres are not so dull witted as to fail to recognise such a likelihood. Leadbelchers, Butchers and Bulls prepared for what might emerge. The Ogres’ magic proved less useful than they might expect. A handful of units felt invigorated by the spells. But while the Butchers fumbled and stumbled, the Scraplauncher hurled its first load into the air killing six skink skirmishers in total. The Gnoblar crew giggled manically at the sight of what they had done, then busied themselves re-loading. They had started to think this could be fun! Out on the far left of the Lizardmen line, the Oldblood could see well what would unfold if he were to lead his Cold Ones directly forwards. Deciding that such an action would be too wasteful, he signalled the Kroxigors and Skinks to proceed as best they could, while he wheeled his regiment around and headed off towards the centre of the field. On the other side of the field, the Lizardmen’s left flank, the Chameleon Skinks in the wood came close enough to the edge to unleash their deadly darts at the Maneaters, and these darts were joined by those of another unit of Skinks moving forwards from the main line. Between them they managed to fell a Maneater and wound another. In the centre of the Lizard line the main regiments of Saurus held their positions, as their Lord was happy to see what magic and missiles could do to the enemy before he committed his fighters. The Slann’s fabled magical abilities, however, were to let him down. Neither he nor his skink priests could bring about any harmful incantations, for either their will proved incapable to the task or the enemy found some means to brush the magic aside. The Razordons’ first shower of barbs fell short of the foe, and the Stegadon’s massive arrow flew straight past the giant. Lord Actyrix pondered (he did a lot of this). But in the end he decided he had not given his intended plan enough time. He would continue his cautious stance, and see whether magic and missile would prove somewhat more effective as the battle rolled on. 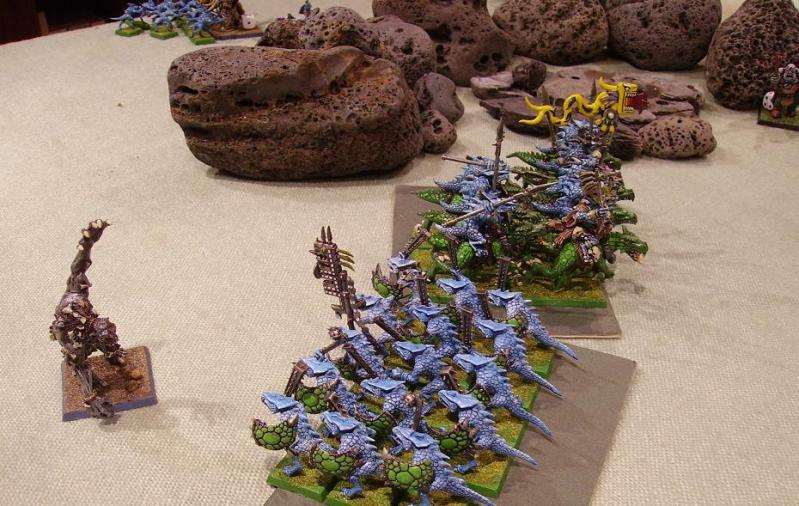 Knowing that to allow the little lizards to continue their shower of darts could bring them all down, the Maneaters and Bull Ogres on the left flank were forced to charge the chameleon and blue skinks, causing both to flee. Perhaps this would buy the Ogres the time they needed to get their warriors into battle alive? 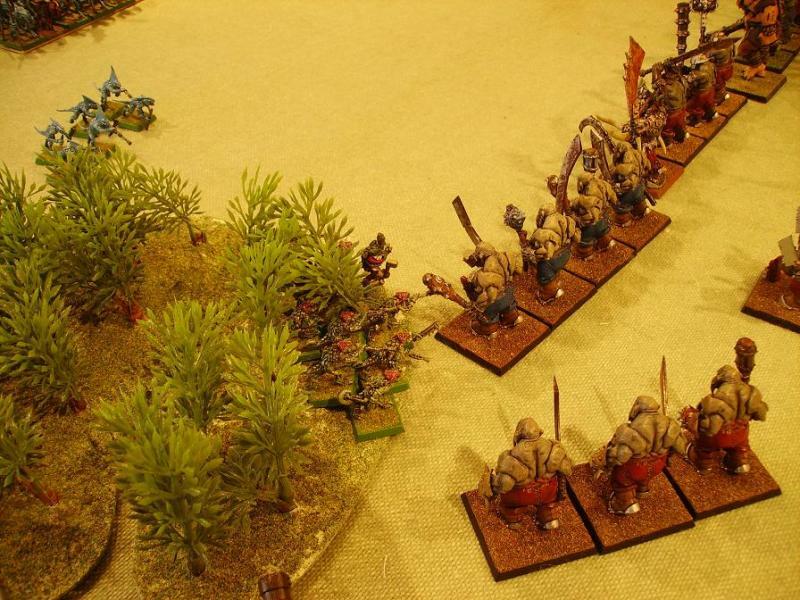 On the farthest left of the line, the lone Bulls unit moved as fast as it could forwards – perhaps it could deal with the pesky skinks if they should rally and reform? Upon the right of the Ogre’s army the Leadelchers and Gnoblars moved tentatively forwards to position themselves as best they could to keep the Kroxigors busy. The Hunter joined in the two companies of Leadbelchers’ effort to bring the giant lizards down with missile fire, and between them they did indeed manage to fell two of the enemy. The big surge came in the centre, though Bufbar did not move as far as he could have done, still wanting to keep some sort of line with his brother tyrant. Ahead it was obvious that the Lizards had chosen to adopt a defensive stance, buying time for their skinks, magic, barbs and bolts to work – some units had even shifted backwards to prepare for the onslaught. Both Tyrants wanted to be the ones to deliver the charges, and not receive them. 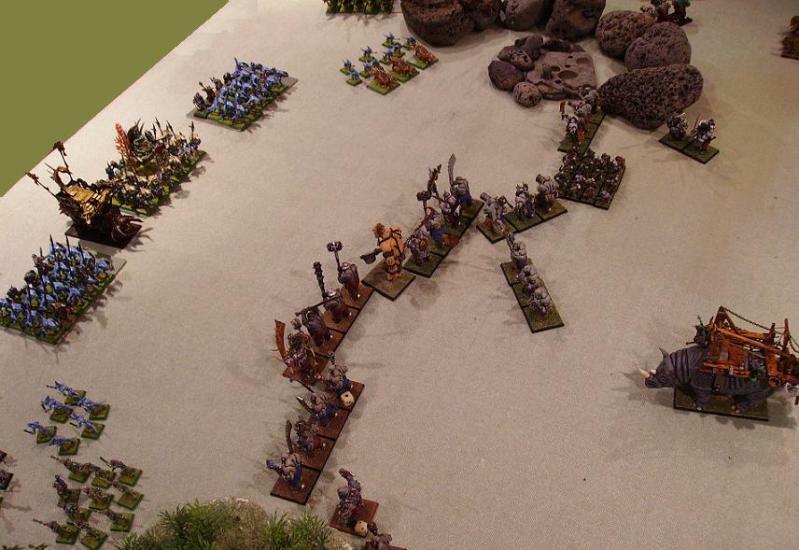 Upon the centre right, on the near side of the half-moon of rocks, Leadbelchers and Butchers attempted a cautious approach towards the Razordons, hoping that they might blast the dangerous looking beasts before they could unleash another hail of barbs. Of course, they had never seen such creatures before, but they had just stepped over a mass of spines spread across a wide area of ground. That first lot had fallen short, but every Ogre knew that should a second hail be released, it had to sting! The Butchers now contributed what they could, toughening up a couple of units with magical protection. Their spell Bonecruncher and the magical Bangstick one was carrying took three of the Razordons handlers down, and wounded one of the beasts, but annoyingly had left all three creatures able to fight on. The Scraplauncher was now ready to try again, and this time slew ten Saurus warriors in a direct hit, half of which died instantly from the wounds inflicted by the rain of rusty old weapons collected on the long journey south. 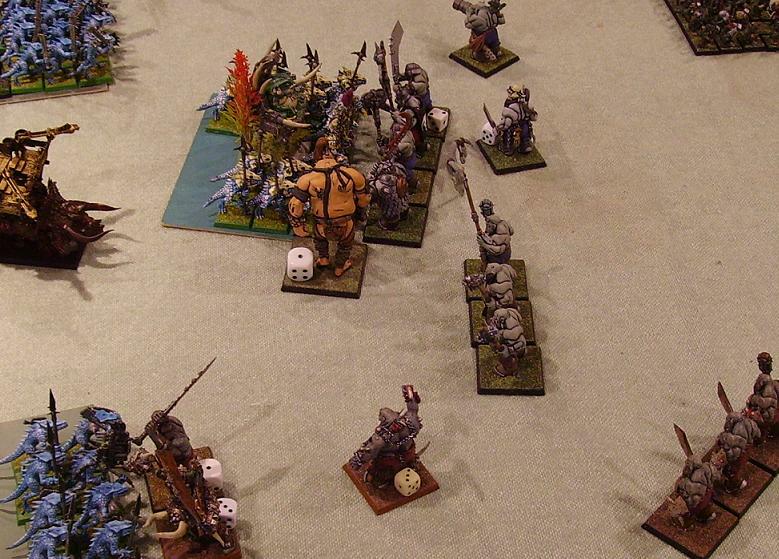 One of the Leadbelchers on the right flank had exploded, felling the Ogre carrying it. The other two, wounded and dazed by the blast staggered in shock away from the rocks – as if chased by the echo of the blast, and in so doing crashed through the company of Gnoblars to their right, scattering the little goblins so that they fled off the field entirely. The Saurus Oldblood now discovered that his need for speed was to be frustrated by his warriors’ mounts – here he was attempting to move sideways across the field to jouin the battle, and all the Cold Ones would do was stumble stupidly forwards as if suddenly and overwhelmingly confused by the fact that there was no longer any enemy in front of them. 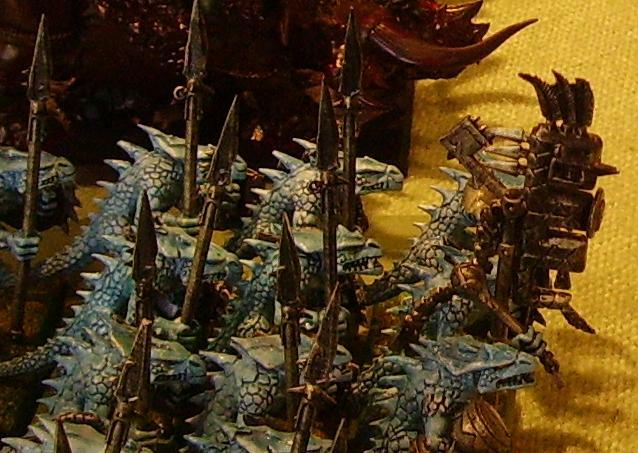 As the Saurus warriors pulled at their reins, elsewhere on the field every fleeing skink rallied, their cold blooded nature meaning that they soon forgot any half-felt panic they had suffered previously. The Razordon Handlers recognised the benefit of the hard cover by their side, and prodded their beasts into the rubble of rocks to ready for the next attack. 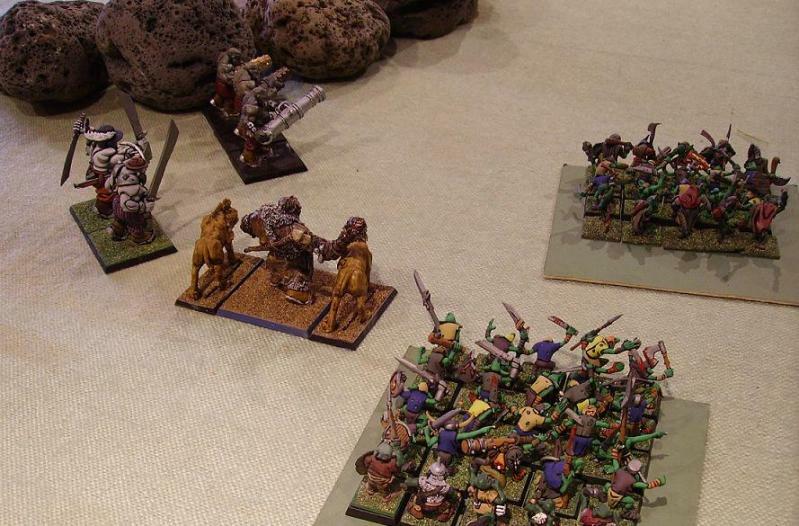 Showing similar caution, the Scar Veteran commanding the shattered regiment of Saurus Warriors decided discretion was best, and bound over to join the Temple Guard to his left. The Kroxigor, having nowhere to hide, continued their advance, this time heading directly towards the Hunter and his brace of Sabretusks. But apart from this, there was very little Lizard movement elsewhere. Magic now came rolling out from the Slann and his Skink Priests, with a combination of fiery blasts and conflagrations wounding Bufbar twice and nearly killing two of his Irongut bodyguard. Lord Actyrix was seen to smirk, something his Templeguard had seen only once before, though that first time there seemed to be entirely nothing occurring to amuse him! His smirk remained a moment longer, for the Slave Giant was wounded by a giant bolt from the Stegadon’s bow, and Razordon Spines tore into the Butcher and the leadbelchers, wounding the first and felling one of the latter. Could it be that the battle was now finally turning the Lizardmen’s way? Maybe so, because as one Bull fell on the Ogres’ left flank, the other two fled in panic. At that same moment on the other side of the field the Skinks let loose umpteen darts at the fleeing Leadbelchers to sting them further and ensure their flight from the field of battle! With a cry of rage, the Hunter threw himself and his brace of faithful pets at the Kroxigors, slaying the champion with three vicious blows. As the Sabretusks dragged another Kroxigor down, the last surviving Lizard took to its heels and fled away from almost certain slaughter. Elsewhere the Ogres unleashed more charges. One Butcher broke from the Maneaters to launch himself at the Chameleon Skinks to his left, though frustratingly his blade could not find purchase on the little dancing warriors! Unable to restrain himself any longer, no matter his promise to his brother to keep the line, Bufbar led his Ironguts in an impetuous charge against the Saurus warriors ahead of him. And failed to reach them! More cautiously, several units of Leadbelchers, Maneaters and a pair of Butchers all manoeuvred in an effort to find some way to deal with the Razordons lurking dangerously in the rocks. When their subsequent magical and missile assault came, however, even though spells a plenty and bullets galore were let loose, only one lone handler was killed. Every Ogre by those rocks now knew they would be receiving another hail of viciously barbed spines, and none was particularly happy at the prospect. The Scraplauncher now proved itself as unreliable as it had done on several previous occasions. The Rhinox, annoyed by something that a careless Gnoblar crewman did (I won’t go into anatomical details), turned and ran away from the battle. The crew now spent precious time simply trying to regain control of the irksome beast! It was becoming clear to Lord Actyrix that he must commit his real warriors to the fight, and fast. Giving the command with the slightest motion of one finger, and utilising the power of his Blessed Totem, he caused his Temple Guard to launch themselves unnaturally fast at Agrobog and his own Ironguts, who were quite surprised by the unexpected onslaught. 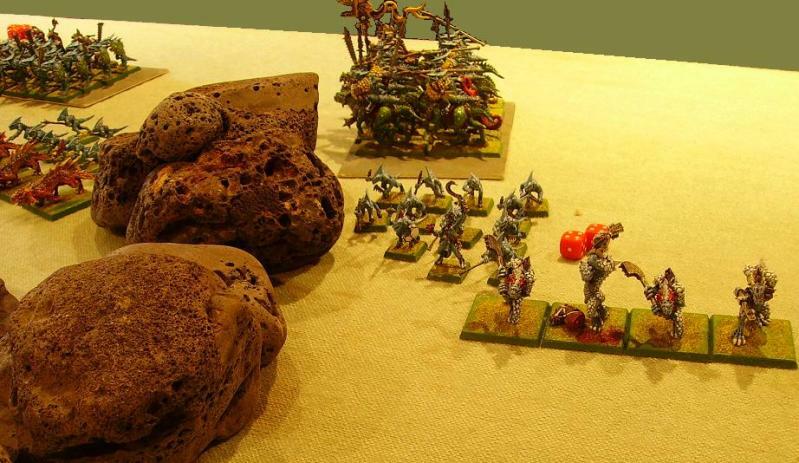 But although the Slann Lord was happy to try such a bold charge himself, the rest of the Lizardmen simply shifted their positions hither and thither. Even the Cold One Riders could still find no opportunity to charge. If their mounts had not refused to act sensibly a little while before, they might have been able to commit to the battle. But the beasts were contrary creatures, and had proved less than helpful so far! The Slann Lord found the act of entering combat, a deed he had not done for hundreds of years, more than a little distracting. As a consequence he fumbled his conjurations and failed miserably to bring about any sort of magical effect. His skirmishing skinks were not so unlucky, however, for they took down another Maneater, while the Skinks near the Hunter dispatched one of his pets as well as weakening him with their poison. The Stegadon tried once more to skewer the Giant but missed, whilst its ancient cousin released an impressive cloud of lethally tipped darts at more Ogres. 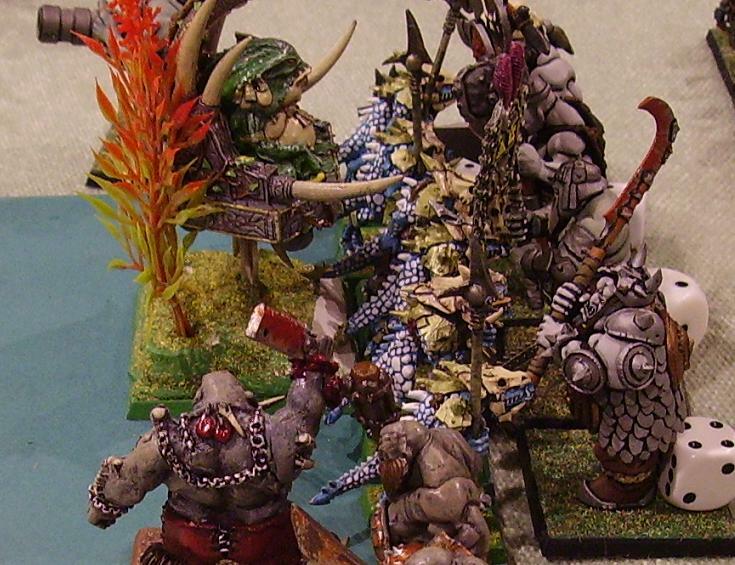 Better yet, the Razordons flicked even more spines into the air, felling an Ogre and wounding a Butcher. At last the Lizardmen’s missiles were beginning to inflict noticeable damage on the foe. Whether this came too late to swing the battle was yet to be seen, though it became clear that the hand to hand fighting was not to go easily the Lizards’ way, as the Skinks fighting the Butcher broke and fled from him (only to be cut down in pursuit) and in the centre of the field Agrobog cut a Scar Veteran to pieces in the challenge and as a consequence the Slann’s unit failed to break the Ogres. At least the Saurus themselves were not yet disheartened and they fought stubbornly on. Suddenly reinforcements arrived, Bufbar’s Gorger appearing to hurtle towards the rear of the Jungle army. At the same moment the Ogres began to pick up the pace a little, with the Maneaters finally raising their weapons in anger and smashing into a body of blue Skinks and the Giant stumbling his way into the flank of the Templeguard regiment engaged with his master. 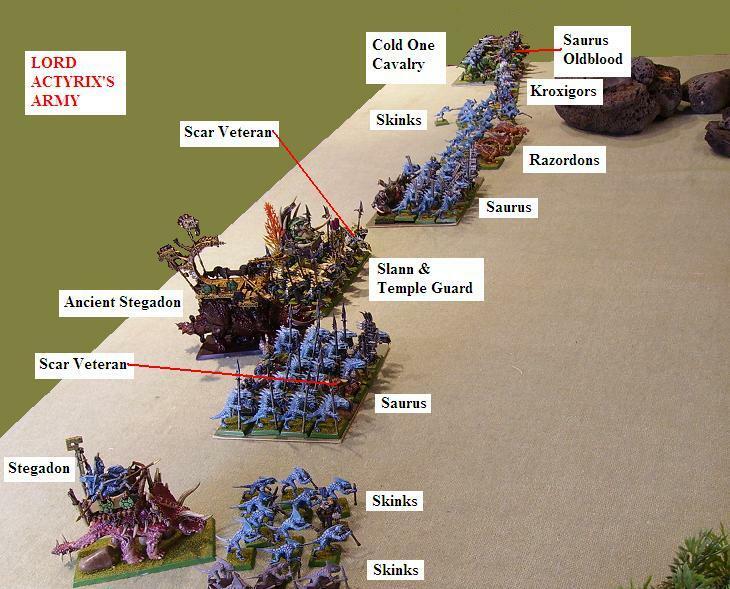 Bufbar threw himself and his last Irongut at the weakened regiment of Saurus, whilst on the left three Leadbelchers charged some skinks, and off to the far right the Hunter and his remaining Sabretusk leapt at the Skinks before them. Starting to feel the joy of bloody battle surging through them, the Butchers began to throw some truly harmful magic around them, magically crunching the bones of umpteen enemies. A Cold One collapsed, as well as three Saurus warriors and even a Skink Priest. Best of all (for the Butcher’s future survival) they wove the spell Braingobbler into being, and thus sent the Razordons fleeing away, smashing into the impassable rocks behind them. Whilst a Leadbelcher perished as his own weapon exploded in his hands, and a Maneater cursed at the inaccuracy of his brace of pistols, the gnoblars regained control of the Rhinox, turned it around once more and sent a third rain of death at the foe, bringing down a Cold One Rider and two Saurus warriors. The little goblins were really beginning to enjoy themselves. As for the fighting, it was going the Ogres’ way. The Leadbelchers on the far left of the line sent the Skinks fleeing away from them after killing umpteen, whilst Bufbar, his rage boiling over, tore the Saurus champion to pieces and smattered all the warriors nearby with bright scarlet blood. Even though an Irongut fell, the Ogres were clearly doing better. In their stubborn manner, however, the cold-blooded Saurus fought on. In the very centre of the field, Lord Actyrix once again felt his stubborn warriors’ resolve tested. The Slave Giant grabbed at one of the Saurus warriors, who in turn hacked off the Giant’s hand. The wound proved fatal to the already badly wounded Giant, who now fell forwards to crush and kill four Saurus warriors beneath his corpse. As every warrior in the fight struggled to maintain their footing with the crashing impact of the Giant’s fall, the tyrant Agrobog bloodily dispatched the Templeguard champion. The Tyrant was glad when the enemy refused to flee – like his gnoblar slaves on the Rhinox to the rear, he too as beginning to enjoy himself! Worry began to cloud Lord Actyrix’s mind. It was not like him to miscast his spells, and the way in which the Ogres swarmed all around, their shouting and roaring almost deafening, was not helping him to regain his balance. Perhaps the great Slann’s uncertainty was contagious, because once again the Cold Ones proved troublesome and distracted, and it was all that the Oldblood and his warriors could do to shuffle forwards a little and maintain their ranks and files. Luckily, the confusion was not shared by the Stegadon, which now launched itself into Maneaters with a roar loud enough to momentarily outdo all the Ogre’s cries together. Not to be outdone by its kin, the Ancient Stegadon also galloped forwards, but the Ogre Bulls it aimed itself at felt such fear that they fled away, surprisingly nimble, leaving the giant creature stumbling around breathless with no foe to fight. 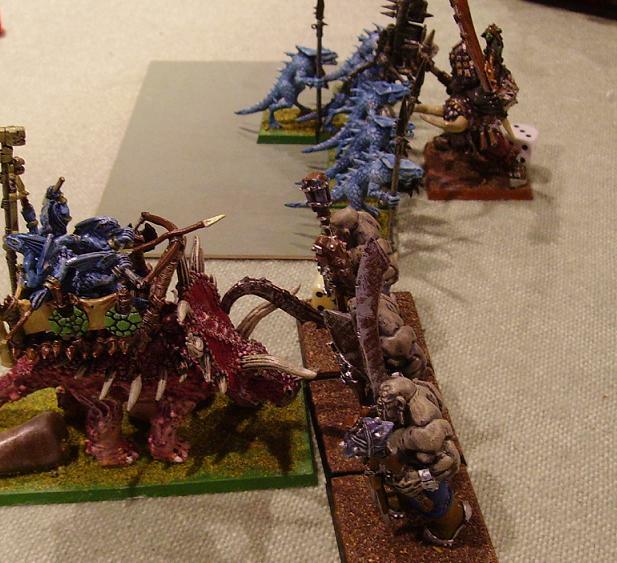 Upon the Lizardmen’s left flank, seeing the Cold One Riders’ uncertainty, the Saurus Warriors decided that they could no longer hope to back up their master in the centre of the field, and turned to face the Gorger threatening both them and the Cold One Riders in the rear. The Slann’s magic was now truly fizzling out, for nothing could be done to harm the foe. The battle had become a trail of strength and fighting skill, and of that there was good and bad on both sides. The Hunter brushed the Skinks away as the Stegadon did the very same thing to the Maneaters. Neither could catch their fleeing foes, however. And while Bufbar found himself wounded and having to summon courage enough to fight rather than flee, his brother Agrobog now dispatched a third hero in a row, cutting a Scar Veteran in two. Hardly any Templeguard remained, barely enough to shield their master, but they felt their duty keenly and fought on. Lord Actyrix was already preparing himself for the inevitable. Death, that which he had cheated for centuries, was close. He was wise enough to be under no illusions. The very sight of the Slann Lord was enough to befuddle one of Agrobog’s Butchers, who subsequently led the Maneaters he had joined in a pointless meandering route. No such confusion for the Gorger, however, who decided the rear of the Cold Ones presented a much more attractive target than the bristling spears of the ranked Saurus warriors, and so charged boldly into them. He didn’t really manage to hurt them much, but he held them, for they couldn’t break him. 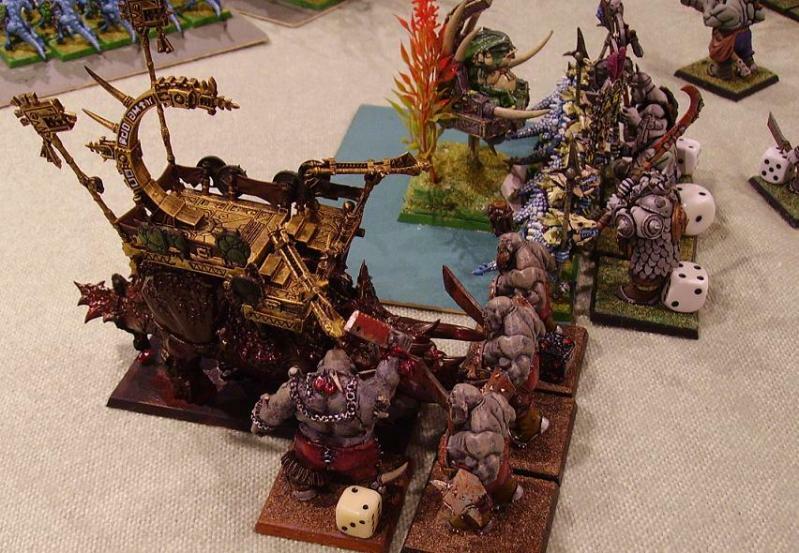 It now became evident that they were not going to be able to rush to the aid of their Slann Lord. Nor did Bufbar’s Butcher fail in his duty, for he now charged into the flank of the Ancient Stegadon currently blocking his way to the Slann Lord. Spurred by the sight of the Butcher’s bravery, the nearby unit of Bulls chose to join him and threw themselves at the beast’s front. Agrobog was also joined in his fight by a Butcher. As the melee’s became messier, the shooting continued too. Another load of scrap hurtled down to kill two Saurus Warriors in the large unengaged regiment to the left of the Lizardmen’s centre. Then more damage was done by the leadbelcher approaching them, who felled another. Even the Gnoblars managed to wound the last surviving Skink priest by throwing a collection of sharp stuff they’d been hoarding. But it was the fighting that was finally to break the Lizardmen. Bufbar, himself grievously wounded and close to death, smashed two more of the Saurus foe into the ground. This was too much even for the dim-witted Saurus warriors, who finally broke and fled away, leaving Bufbar standing upon a heap of corpses, struggling to catch his breath and wiping blood from his eyes. Nearby, the Butcher and Bulls fighting the Stegadon bashed it down and killed it, then the butcher leapt in a surprisingly agile move over the corpse to hurl himself into the combat against the Slann. There his rusted cleaver took a hefty chunk of flesh from the Slann, while Agrobog, the other butcher and the champion Irongut slew all but the very last of the Templeguard. Now came the last, almost pathetic efforts by Lizardmen to retrieve the battle. The Stegadon charged down the lone Maneater ahead of it and trampled him to death through the weight of impact alone. The last surviving Kroxigor (recently rallied) dashed at the Hunter, but unlike the Stegadon it never reached its foe, succumbing to the Hunter’s bolt-like spear. It was at the centre of the field, however, that the battle was now decided. Agrobog, having dispatched two heroes and a champion in challenges he was incapable of refusing, now turned his attention to the Slann Lord. Five times his huge blade hacked into the bloated amphibian, and four times the Slann summoned magical protection enough to dissipate the harm. But one blow struck deep, and drew spurting blood. Lord Actyrix, perhaps bemused, perhaps sensing the almost forgotten sensation of fear, turned and attempted to flee the field. 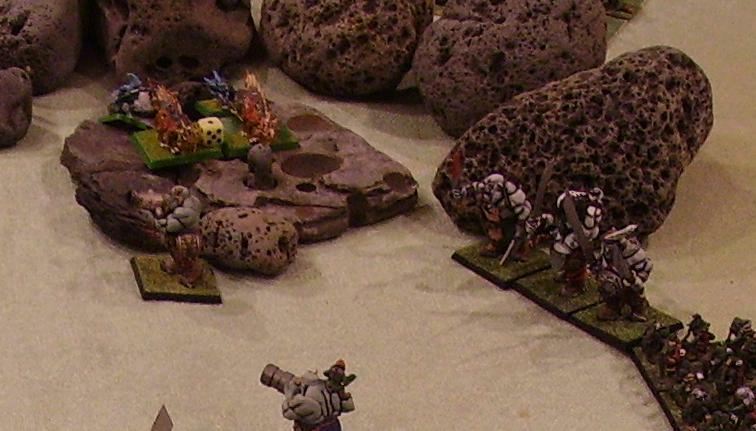 Agrobog belched calmly, (he’d been holding it in) and then stepped forward to hack the Slann in two from behind. Both tyrants now cast their heads about to see where the other was. Bufbar grinned at his brother, both of them besmeared generously with blood. Agrobog grinned back, revealing his misshapen, yellow teeth. Then, as his brother Bufbar began to rock with maniacal laughter, he leant down and thrust his hand into the gaping wound in the Slann’s back. When he tore his hand out, he was clutching Lord Actryix’s heart. Pausing for the briefest of moments to appreciate the strange appearance of the huge, fatty organ, he then stuffed it whole into his gaping maw. He turned to look at his brother again, blood streaming down his chin as he began to chew. Bufbar’s laughing doubled, became thunderous, certainly painful for the badly wounded tyrant. But he cared not. Instead he stumbled, weak kneed with delight, collapsed onto the steaming corpses of the Saurus he’d already killed, and began flailing around like a delighted child. Victory to the Ogres (conceded end of turn 5 by the Slann player). PS: Thank you D & J for a brilliant game. Chaos, the Chaos device, the Chaos logo, Citadel, Citadel Device, Darkblade, the Double-Headed/Imperial Eagle device, 'Eavy Metal, Forge World, Games Workshop, Games Workshop logo, Golden Demon, Great Unclean One, GW, the Hammer of Sigmar logo, Horned Rat logo, Keeper of Secrets, Khemri, Khorne, the Khorne logo, Lord of Change, Nurgle, the Nurgle logo, Skaven, the Skaven symbol devices, Slaanesh, the Slaanesh logo, Tomb Kings, Trio of Warriors, Twin Tailed Comet Logo, Tzeentch, the Tzeentch logo, Warhammer, Warhammer Online, Warhammer World logo, White Dwarf, the White Dwarf logo, and all associated marks, names, races, race insignia, characters, vehicles, locations, units, illustrations and images from the Warhammer world are either ®, TM and/or © Copyright Games Workshop Ltd 2000-2009, variably registered in the UK and other countries around the world. Used without permission. No challenge to their status intended. All Rights Reserved to their respective owners.